Excerpt from presentation delivered at the Cape Construction Expo, 31 October, at the CTICC, Cape Town, as part of the ‘Materials Zone’ workshops. People, in general, respond to wood as if connected to it somehow – it appeals to more than just the visual sense, also to touch and smell. If someone walks into a kitchen with a wooden counter top, or picks up one of my timber light fittings, the fist thing they do is run their hands over it – to feel it’s smoothness; sometimes they will even smell it. You don’t often see that happening with other materials. WHY SHOULD WE BE USING WOOD? Some of you might think of, when thinking of using wood; of deforestation, or of the fact that it may burn? I am going to tell you the other side of the story. This is coupled with expanding economies (albeit slowly at present), causing the need for ever increasing resource extraction, and a growing population, with a housing backlog currently of 2.1 million houses in SA. So the question is; how do we meet, not just the South African, but worldwide need for housing? …without further increasing carbon emissions and depleting resources. What we have is the situation of Housing vs Climate Change. Concrete, steel and masonry are all great building materials, over that there is no doubt. – so wood …is like natures gift to us! By using wood instead of conventional materials like concrete, steel and masonry, not only reduces the amount of CO2 emitted, at the rate of 0.9 tonnes of CO2 per cube of material used, but also locks away CO2 for the lifespan of the product, and then if disposed of – makes its stored energy available. That’s not to say we try and use wood for everything, as each type of material has its advantages – concrete and masonry have, for example, high thermal mass, which is often required in a design – but in general, the more wood we can use to replace other materials, the better for the environment. So, with stats like 70% of the developed worlds populstion live in timber frame homes, why is the percentage of timber buildings so small in SA? Fire ….but won’t it burn down? Having you ever tried making a fire with a match and a log? – Effective design for fire safety is not about preventing a building from burning if a fire gets out of control – but rather to ensure a safe evacuation of the occupants – ie the structure must remain stable long enough to get everyone out safely. Deforestation ….but you are cutting down all the trees, and there won’t be any left – that can’t be good! Durability …how long will my home last? In trying to better understand attitudes towards timber homes, given the clear advantages and consistently small uptake, I at the end of last year, along with Timber IQ magazine, did a Timber Building Poll. We had just short of 120 respondents, of which 38% had previously or currently still, lived in a timber home. What was most interesting to me was how the responses of those who had, and hadn’t actually lived in timber homes, compared on average for the same questions. So, not only was the maintenance of timber homes not seen as higher than a brick homes on average, but is was even less of a concern to people that had lived in timber homes. I’ve discussed the advantages of using timber from an environmental point of view, but are the advantages of building a timber home; for the client, the architect or designer, and the builder? Ease of construction and time to construct – it takes significantly less time to build a timber home than a similar brick & mortar home. It’s also easier to alter or add on to at a later stage – and a lot less messy. Contemporary – driven by technology everything around us is advancing in leaps and bounds. Think cellphones, tablets cars. Timber, along with other new lightweight building systems, allows us to be part of that technological revolution – rather than still building the way we were in the pre digital age. Technological advances in design software and digital fabrication technologies are now to allowing timber to be cut and fashioned to any shape you desire. 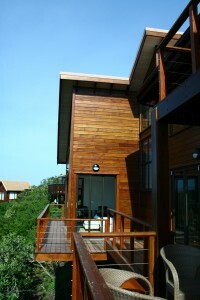 Building Regulations – Timber homes are included in the South African National Building Regulations standards, in SANS 10082, Timber Buildings. When built to these standards they also automatically achieve the standard required for registration with the National Home Builder Registration Council (NHBRC). They are also easily designed to meet the requirements of the new Energy Efficiency regulations SANS 10400 Part XA. Passion – speak to any specialist timber builder and you are likely to find someone with a passion for their craft and for working with wood. Who would you rather have building your house? Precision & neatness– building with timber is a precise form of construction. Everything needs to be just right to work. For a builder and all involved it’s easier to monitor and see that everything is working according to plan. I hope I have shown you enough of the advantages of building with timber, to give it some though as an option when planning your next project. From our side, along with the ITFB, there is a continuous drive to increase awareness of the benefits and to promote timber frame as a building method. With SAFCOL, whom I consult to occasionally, there has been a drive over the last few years to change perceptions of timber buildings by building good quality timber frame school classrooms, crèches and other buildings as part of their Social Enterprise Development program. There is also currently a drive to get government departments to consider timber buildings as an option, currently with a view to timber libraries and schools – so we might see that coming on line in the next while – all of which will help promote the acceptability of timber buildings. From a consumers point of view I think we should few building materials the same way we view our food – instead of extracting and manufacturing – lets think about growing it! Nature has, after all, provided us with an option we seem to have forgotten about, a perfect building material that we can grow, harvest, re-grow and use in perpetuity. Despite statistics such as 70% of the developed world’s population live in timber frame homes, and despite the resurgance in the popularity of timber homes in Europe in the last decade, my question is … will timber homes in South Africa remain with such a relatively miniscule share of the local market? Numbers of timber homes built in SA were hard to find – the Local Authorities don’t collect data on the type of structure when plans are submitted; untill I remembered that one of the 2011 Census questions were: what type of material are the walls you house made of? …and the census data is freely available. The predecessor of the timber home in South Africa are the wood frame and iron clad homes, some imported in kit form from Europe, and others designed and built here – in the late 1800’s to early 1900’s. The most well known of these is the Smuts House, pre-fabricated in the UK and shipped to India, and later brought to South Africa where it was re-erected at Doornkloof for Jan Smuts in 1909. An example of an iron clad timber frame building designed and built locally, is the Globe Tavern in Barbeton, which opened for business in 1887, designed by Arthur Hubert Halder. Another example is the Millwood House, now a museum in Knysna. The house was originally built in Millwood during the ‘Gold Rush’ (very little Gold was found) in 1885, and was later relocated to Knysna, in sections, by ox-wagon, and re-constructed where St George’s Church Hall now stands. It was moved to it’s present site in 1910. An example of a remaining timber clad building from that era is the Woodcutter’s Cottage, built in the 1880’s, on display at the George Museum. Up to the 1950’s, the few timber buildings that were built were still being built of hardwoods. It was only around that time, with the introduction of preservative treatments, that softwoods such as Pine started gaining in popularity as a construction material, and was in the 1960’s that timber buildings were re-introduced as an alternative to brick and mortar. Among the pioneers of this re-introduction of timber homes were Searles Homes in Great Brak River, who initially built timber frame homes to house the staff for their shoe factory. Others were Elgin Homes in Grabouw, and NST in Knysna, who introduced solid wood and log cabin building systems. 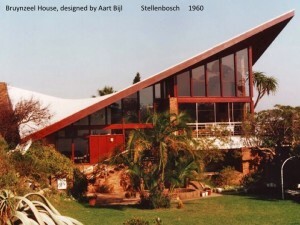 While it’s evident that much of the design at the time was based on practicalities, an exception to this was the magnificent Bruynzeel House in Stellenbosch, with its hyperbolic paraboliod roof, designed in 1960 by Aart Bijl and built by Kees Bruynzeel, a Dutch wood merchant. The majority of timber homes at the time, however, were relatively inexpensive holiday homes built along the Southern Cape coast, many of which were prefabricated. In 1982, some members of the timber building industry got together to form the Timber Frame Builders Association, now called the Institute for Timber Frame Builders, which went a long way in achieving the recognition the quality timber buildings enjoy today, particularly with regards local authorities and lending institutions. 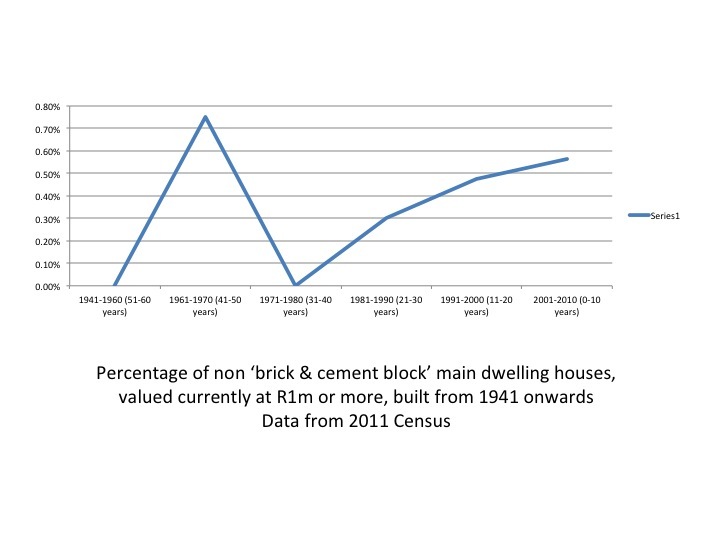 If we look at a graph from the 2011 Census data showing the percentage of ‘non-brick & cement block’ houses since 1960, we see, however, that beyond the spike in the 1960’s (from close to zero % before that), little if no growth in percentage has occurred up until now. This is while the percentage of timber buildings continues to increase year after year in many parts of the world, as people become more aware of the benefits of the systems available. I can only guess that the perception of timber homes as a cheaper & less desirable alternative, perhaps still a result of it’s humble iron clad origins and later cost–effective prefab holiday house, still persist amongst many. What is the fuss all about? Should we not just continue doing things here as we allways have, building most buildings out of bricks and mortar? What are the benefits? Low embodied energy – Of the various readily available raw materials for building, timber has by far the lowest embodied energy, and if grown in a sustainably managed plantation, is a truly renewable building resource. In terms of strength to weight, radiata pine, for example, has a strength to weight ratio 20 percent higher than structural steel, and more than four times that of unreinforced concrete in compression. Versatility – So thanks to the extreme versatility of timber, your timber home could be anything from a humble log cabin, to a grand Cape Cod style beach house, a sleek glazed all round clad post & beam house, or a digitally crafted open plan contemporary house with a freeform double curved roof. 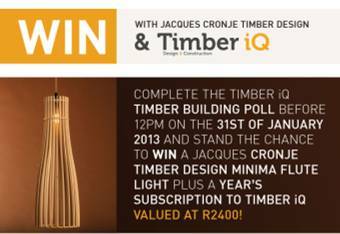 In trying to understand, given the clear advantages and consistently small uptake, I recently set up a poll, along with Timber IQ Magazine, to help determine the attitudes towards timber homes in SA. So, while at best the results could be said to be biased, as it was mostly people who like or have lived in timber homes who took time to do the survey, what I found relevant is that the comments by people who have lived in them showed that timber homes, even amongst this sample group, perform and are generally better than what the perception is. So to answer the earlier question, will timber homes remain marginal in the built environment in SA? ….or will we see it grow as elsewhere? My guess is that is that, as the pressure on resources increases, the efforts to slow down global warming escalate, energy costs escalate, along with the ever increasing technologies, there will be a shift. And possibly a large one. And at the current low base of at best 0.5% of the market, even a 0.5% shift from brick to timber frame represents a 100% increase in demand for timber homes. And a still relatively small, compared to elsewhere, say 5% shift, represents a 1000% increase. I think the timber building industry may soon get very busy, and I invite more participants. Any building project, along with the accompanying architectural service, is divided into two main phases; the architectural design & documentation phase, and the construction phase. Within these phases, the architectural service is divided into distinct work stages, as below, with the percentage indication the stage as a percentage of the complete architectural service. The first step on appointment is an in depth discussion to ascertain the programmatic requirements of the project and budget. With regards budget, consider the total amount of the investment you would want to spend, including all professional fees. This provides a good starting point and guidance in the design. In order to achieve your objectives within budget, one needs to start with this in mind and review the project and choices being made against the budget periodically along the way. A visit to the property will then be required to do an analysis of the site. This will include consideration of issues such as the views, orientation, access, topography, climate and micro-climate, vegetation and soil type, access and precedent set in the area. This would be coupled with an enquiry made to the local authorities, or studying of any documentation pertaining to this if these enquiries have already been made, to ascertain all rights and restrictions pertaining to the site. A design brief will then be prepared, and an outline concept will be formulated based on your accommodation requirements, design requirements, the contextual issues stemming from the site analysis and your budget. You will also be advised on what consultants will be required, for example a land surveyor, engineer, environmental consultant etc. depending on the nature of the project and site. This will be presented to you in the format of a ‘Building Cost and Fee Estimate’ which outlines the projected costs for the building and associated professional fees as well as the local authority and any other approval fees that may be required. You will also be advised on the estimated timelines in terms of the various architectural stages, as well as the anticipated project programme, depending on the scale of the project. Based on the architectural brief developed from the discussions and site analysis in Stage 1, as well as your budget, an initial concept design will be prepared. This will show the intended space provisions based on the accommodation requirements, as well as the planning relationships and proposed layout based on the requirements and contextual issues stemming from the site such as views, orientation and access. It will also show the proposed intended concept and form of the buildings. These will be communicated via schematic layouts indicating the planning relationships, formulated into more formal ‘sketch’ floor plans, as well as basic 3d perspectives to illustrate the proposed form, look and feel of the buildings. After your review and comments on this the initial concept, the design will be further developed to show the proposed materials as well as the technical and functional characteristics of the design. These will include sections through the building, more detailed dimensioned sketch plans illustrating window and door positions and proposed furniture layouts, as well as elevations of the building. At this stage services affecting or affected by the design will also be incorporated into the planning. This would include items such as solar panels and watertanks. As the sketch plans form the basis of the entire project, this may be a back-and-forth process until all parties involved are entirely satisfied with the outcome. The sketch plans will at this stage be reviewed against the proposed budget and suggestions made to reduce the scope of work (or adjust the budget) if required to bring back within budget, as well as reviewed for conformity with rights of use and building restrictions (height restriction, building lines etc.) of the site. You will be advised if any consultants are advised at this stage. For larger projects where a Quantity Surveyor is being appointed to oversee the financial management and cost control of the project, they would be brought on board during the sketch plan stage to provide the initial cost estimates. The design development stage will commence once the final concept design, along with estimated budgets based on this, are approved. The plans will then be further developed based on the approved concept design, with any further changes that may be required, as well as the input from the consultants. In the case of the input from the structural engineer, this will include the specifications of the foundations, suspended floors and the roof design. At this stage details, specifications and any adjustments required in terms of energy efficiency will also be undertaken. The design development will include details of the construction systems and materials to be used. The basic 3d model used in the initial concepts will also be developed and detailed 3d perspectives will be produced of the exterior and interior of the project. After any further changes are made, the final set of design development plans are produced. These will include detailed floor plans, sections showing the materials and structural systems being utilised, as well as detailed elevations. The design, costing and programme will then be reviewed with the consultants. The building cost and fee estimate will be adjusted to suit the revised design and sq.m areas, by Timber Design, or by the Q.S. if one has been appointed. Commencement of work stage 4.1 follows on the approval of the final Design Development plans and revised cost estimates. In this drawings and documentation required for submission for the required approvals are prepared. In the case of specialist consultants being required to handle any of these applications, this would be co-ordinated by Timber Design. Documentation produced as part of stage 4.1 includes additional 3d perspectives if requested for aesthetic approval; and a detailed site plan, electrical, solar, gas and drainage layouts and building specifications describing materials to be used, as required by the local authority. The Engineers documentation indicating his scope of work and responsibilities for the project are submitted as part of the building plan document set submitted to the local authority. Certain local authorities will also require an original beacon certificate signed by the Land Surveyor. If height restrictions are applicable a topographical survey plan will need to be submitted as part of the submission documents. In this stage documents are prepared to procure offers for the execution of the works. These would include a set of tender drawings for information, a detailed specification document, documentation from the engineers and any other specialist consultants, as well information relating to the site, timing of the construction plans and the type of contract agreement being utilised for the appointment of the contractor. Selected specialist timber frame contractors are then be invited to tender for the works, as well as separate ‘direct contractors’ whose services may be required, for example for landscaping or the building of a swimming pool. Offers are then evaluated, and recommendations made on the awarding of the principle building contract, as well as any other appointments, as required with direct contractors or nominated sub-contractors. Contract documentation is then prepared and arrangements made for the signing of the building contract. Stages 5 and 6 are optional, and are sometimes excluded from the architectural service provided. It is recommended, however, that unless you, as the the client, have experience administering construction projects, a full architectural service is provided including these stages. The architectural service provided for this stage comprises of the administration of the building contract. This includes administering the handover of the site to the main contractor; the issuing of construction documentation; initiating and/or checking sub-contract design and documentation as appropriate; regularly inspecting the works for conformity to the design and contract documentation; performing the duties and obligations assigned to the ‘principle agent’, as set out in the JBCC building agreements or similar approved contract; issuing the practical completion certificate; and assisting the client to obtain the occupation certificate from the relevant local authority. The final stage is the facilitation of the ‘wrapping up’ or close out of the project, which includes preparation of the necessary documentation to effect the completion and handover of the project. All operable systems, such as solar, sewerage, rainwater harvesting and gas systems are also checked, and it is ensured that operating instruction manuals are in place to facilitate a smooth handover and operation of the all systems. After the contractor’s obligations with respect to the building contract are fulfilled, certificates relating to the contract completion are issued. The client is also then provided with as-built drawings as well as the relevant technical and contractual undertakings and guarantees by the contractor and sub-contractors. Chris Sanderson of The Future Laboratory, in a talk presented at 100% Design, said “the future is allways here already, it’s just unevenly distributed” – and I got a good glimpse of this in the U.K.
A word coined by the Future Laboratory, describes the fusion of business and leisure, and how this trend will impact considerations in the design of both business and residential spaces in the future. Chris Sanderson discussed ideas such as how work life will change as technology disrupts a myriad of industries and some offices will become relics of the pre-internet age as more people work from home. Think offices at home, as well as mini production facilities with the advancement of desktop laser cutters and 3d printers. Conversely, the ‘allways on-line’ phenomena will lead to people in an office environment wanting an ‘off-space’ where they can relax. Lighting is being reinvented by the change to LED lighting. Current regulations in the UK allow 25% of a buildings light fittings to be incandescant or halogen, with the requirement that 75% be low energy lighting. Similarly in South Africa, our new SANS 204 regulations specify a maximum allowable energy demand and energy consumption for lighting, varying for different types of occupancy. LED’s, with their numerous small bright pinpricks of light, are not pretty – and the resultant trend for lighting is a swift move towards seeing less of the light fitting and more of the just the emitted light. I visited the John Cullen showroom, where it was demonstrated how walls and ceilings being are being washed with light by recessed LED strips, or even floors by LED strips built in above the kick plates of floor cabinets. 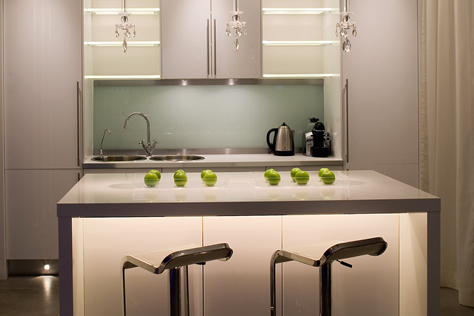 Where task lighting is required it is being done purposefully, for instance by minimal use of directional recessed downlighters positioned above cupboards, artwork, basins and worktops. Pendant lights are there to make a statement, and an ever growing vast array of designer pendants are available. As illumination choices become more complex, particularly in retail and hospitality, it’s soon going to be the norm to use the services of a specialist lighting designer. In residential design the days of designing a house first and then simply adding lights to the plan are soon to be over, as the lighting becomes ever more integrated into the structural fabric of the house. Options of textured wall surfaces were in abundance. Some of these are CNC routed from MDF, others moulded gypsum board. 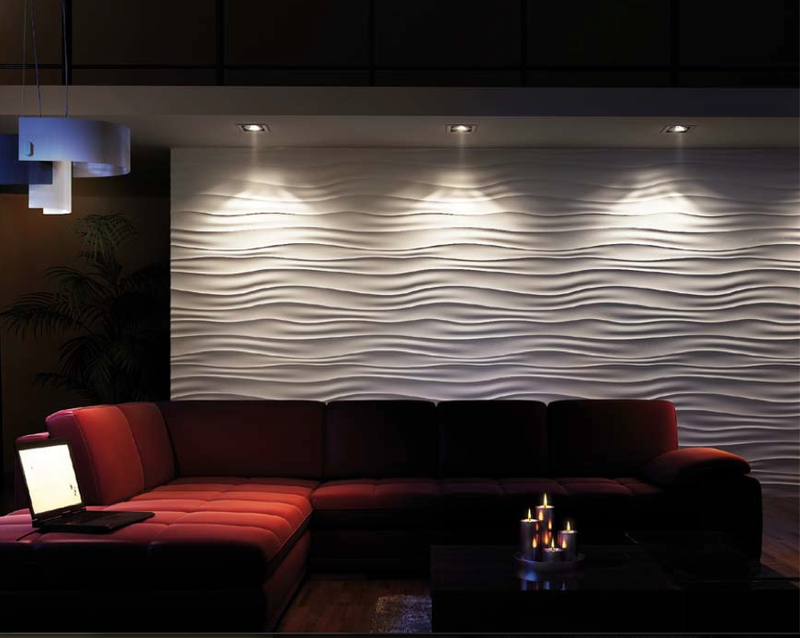 These, tie in beautifully, of course, with the new trend of washing walls with light. I have for long been a fan of transformable furniture, and was wowed by a demonstration of the Yo! Home at 100% Design, by Simon Woodroffe, the founder of the Yo! Home – who has taken the idea of transformable furniture, and indeed the transformation of an entire internal space, to a whole new level. Timber and timber products seem to be the materials of choice for converting beautiful curved forms into reality – owing no doubt to the seemingly limitless ways that timber products can be bent, laminated and cut into any shape imaginable. 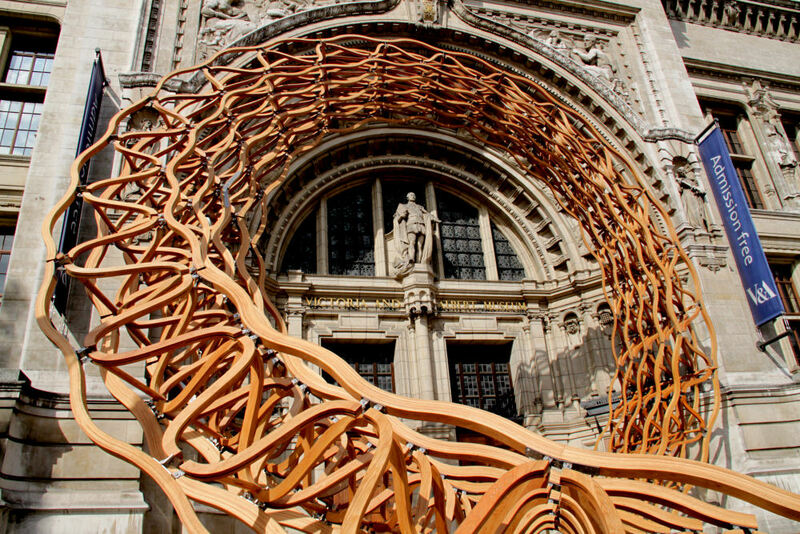 I attended a talk at the UKTFA Timber Expo presented by Arup on the ‘Timber Wave’ installation done for the 2011 London Design Festival, which was an intricately curved timber structure built for the entrance to the Victoria & Albert Museum. Another presentation at the Timber Expo that impressed was by the Ramboll Computational Design Team, based in London, on the modeling techniques that were used to design and fabricate their timber sculpture at the TRADA pavilion at the Expo. They work on computational models that, based on natural principles of efficiency, align materials to stress trajectories, doing so minimizing the amount, or thickness, of material required to create a span or carry load. This type of work is bound to open the doors to a whole new way of thinking with regards the efficient use of materials. If you thought the current trend towards laser and cnc cut products is a passing fad, think again. In fact, on the smaller home based scale, add 3d printing to this stable and you have the start of what may soon be known as the Maker Revolution. As it becomes easier to convert a design to an actual product, even for a ‘one-off’, we will see an ever-increasing diversity in the availability of new and innovative products. This will be aided of course, by the continuing rapid growth of social media, where any individual can quickly and easily get their product ‘out there’ for the world to see. Along with smaller homes and less space, and the growing desire for a less cluttered life, comes elegant storage solutions. Amidst the hustle and bustle and bright colours of the branding, glamorous stores and showrooms, my highlight of the high street was undoubtedly Muji. Muji products are produced with an aim to return to simplicity in life. The products, ranging from shelving, storage containers, office supplies and even clothing, are all beautiful in their simplicity. And in a breath of fresh air, in contrast to the usual heavily branded, expensive and overly packaged goods, none even carry a brand name. Inhabitat.com, one of the worlds most foremost websites for sustainable design innovation, eco architecture and green building, has featured our project, House Wessels. 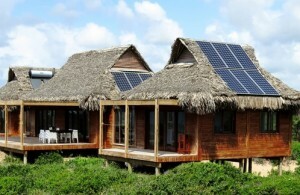 This is thanks to the innovative integration of the solar panels into the traditional thatch roof. The house, situated near Tofo in Mozambique, is entirely off-grid, reliant on solar power for for electricity and water heating, and a borehole for water. Many people have asked why it is that I prefer to design timber frame homes, and more specifically, what the advantages of a timber frame home are. Here are 10 good reasons to build your new house using timber frame. The choice of a timber frame home is going to substantially lower your carbon footprint. Trees absorb carbon as they grow and this carbon is locked away when the timber is used for construction – so the more timber you use instead of more energy and carbon costly materials such as masonry and concrete, the lower the carbon footprint of your home. Timber is also a totally renewable building material. In addition, because of the relatively light weight of timber frame materials, less energy is consumed by the transport of materials. From a purely ecological perspective, a lot less damage is done to the site immediately surrounding a building project when building with timber frame. This is because the work predominantly consists of ‘dry’ trades where products are ‘fixed’ and installed as opposed to ‘wet’ trades where products are mixed and applied on site. Meaning, quite simply, less mess. The structure of a timber frame wall is essentially a hollow cavity with evenly spaced structural timber studs. It is the nature of this cavity, along with the fact that the high insulating properties of timber prevent ‘thermal bridging’, that allow the wall to be easily filled with as much insulation as is required to produce a thermally efficient home – as long as it is designed correctly in terms of optimal orientation and positioning of glazing of course. The amount of insulation required for optimal efficiency, as well as to comply with the recent SANS 10400 Part XA Energy Efficiency regulations, differs depending on the climatic zone in which you are building. Despite it’s history as a traditional building material; as the trend towards the use of sustainable materials increases, timber is also gaining popularity with designers and architects as a material in contemporary architecture. 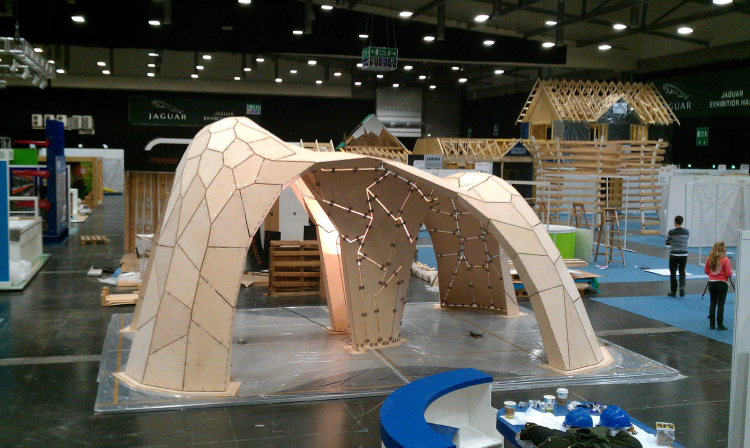 Technological advances in design software and fabrication technologies are now starting to allow timber to be cut and fashioned to any shape you desire. 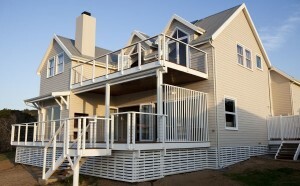 So thanks to the extreme versatility of timber, your timber home could be anything from a humble log cabin, to a grand Cape Cod style beach house, a sleek glazed all round clad post & beam pad enclosable by sliding shutters, or a digitally crafted open plan contemporary house with a freeform double curved roof. The choice is yours. Families get bigger and families get smaller. Children move out, older parents move in. You accumulate more stuff, occasional edit, but mostly accumulate still more stuff. Over the lifespan of a typical house countless changes occur with regards its spatial requirements. And you can be sure that this will at some stage involve building new walls, or breaking old ones down, expanding outwards or upwards or opening up. Whatever your future change requirements, they will be easier, quicker, less intrusive, and usually a lot less messy with a timber home than attempting to make changes to a conventional brick and mortar home. The first question many people ask when enquiring as to the estimated cost of a house is ‘how much is it going to cost per square meter?’. As there are so many variables, for example finishes, proportion of windows and doors to blank walls (windows are more expensive than the equivalent area of wall), and the complexity of the design, that unless the design and finishes have been decided on, the question is not that far off the ‘how long is a piece of string’ question. A more interesting question to consider may be, ‘how many square meters of internal floor area you getting as a proportion of building area? Did you know that, because timber frame walls are so much less bulky than brick walls, you gain approximately 1 sq.m of internal floor area for every 7 running meter of external wall length? The maths is like this; typical cavity brick wall at 300mm (including plaster) less typical timber frame external wall at 150mm (including lining & cladding) equals 0.15 sq.m of floor area saved per metre of wall; multiply by 7 RM and you get 1.05 sq.m. So next time you are comparing ‘sq.m rates’, don’t forget to factor this in to your sums. Literally, when it comes to building – assuming you own or are paying to live where you do while building. If you have just sold your house in order to build a new one you will presumably be paying occupational rent. If you are wanting to sell on completion of the new build the sooner you can do this the better. Renting speaks for itself. If you are building a guesthouse or lodge the sooner you can get bums in beds the better for your positive cashflow. Whichever way you look at it, a longer time spent building costs you more. Now consider the fact that a timber frame home typically takes half to three quarters of the time to build than a conventional brick and mortar home. Besides the knowledge that you are making a positive contribution to global sustainability, you can also have complete peace of mind about the sustainability of your investment. Timber frame homes are included in the South African National Building Regulations standards, in SANS 10082, Timber Buildings. When built to these standards they also automatically achieve the standard required for registration with the National Home Builder Registration Council (NHBRC). They are also easily designed to meet the requirements of the new Energy Efficiency regulations SANS 10400 Part XA. Build using a builder who is member of the Institute of Timber Frame Builders and you will also have the backing of an organization with a 29 year tack record of promoting and maintaining acceptable standards in timber construction in South Africa. Timber is strong, light and reliable, making timber construction on site simpler and safer than concrete or steel construction. In terms of structural material, radiata pine, for example, has a strength to weight ratio 20 percent higher than structural steel, and more than four times that of unreinforced concrete in compression. Timber is also flexible, meaning less chance of structural damage typically caused by heaving clay, or the settlement cracks typicaly found in masonry construction at the top corners of doors and windows. Modern timber construction also has increased fire protection due to the use of non-combustible linings protecting the frames, the availability of fire retardants, and designing for safety by using mass timber with sufficient charring rates. Safety in the case of a fire is all about safety of the occupants, and timber homes, designed correctly, meet all of the fire safety ratings and requirements. 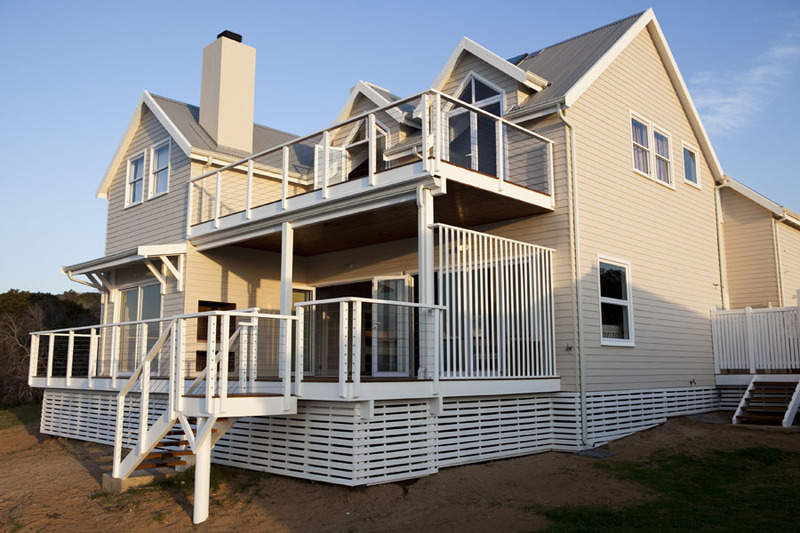 With a correctly designed and built timber home you will never have to worry about typical brick homeowners issues such as rising damp, or for those in the Cape, moisture breaching the cavity. Furthermore, arrive home on a cold winters evening, and a cosy fireplace or heater will heat the home up in no time. This is because, due to the low thermal mass and therefore low thermal conductivity of timber frame construction, the structure itself won’t need to absorb heat to warm up before you can warm up the space. Use timber cladding in some of your living areas and you’ll also get the additional benefit of the feeling of warmth and cosyness exuded by natural timber. Why is it that there are magazines, websites, online interest groups and forums, and building awards dedicated to timber construction? Now I’m not saying that builders who don’t specialize in timber construction don’t care about their work, but you can be sure that most timber builders are passionate about working with wood and take huge pride in their craft. So if you are going to be going with the lowest bidder (which in all likelihood you are), why not ensure that at least that is a choice to get your home built by people whose work is their passion. In 1996 the TFBA introduced the TFBA Annual Building Awards – an event which recognizes builders’ craftsmanship and attention to detail, as well as the designer of each winning project. The newly named ITFB continues with that tradition and each year Gold, Silver or Bronze Certificates are awarded to commemorate outstanding workmanship and design on a particular project.